Before your parent or senior loved one is ready to move into an assisted living community, you need to consider the costs associated with this option. Many families have no idea what to expect in terms of the monthly assisted living costs, especially if this is the first time you’re going through the process. Has a senior loved one struggled to recall the name of an old friend or remember the street that their first house was located on? Little facts like these can be a challenge for seniors to remember as they get older. If someone you love faces memory challenges, don’t worry. There are steps they can take to keep their minds active and improve memory functions. Explore the best activities and cognitive games for seniors that will help their minds stay sharp. Love is a many-splendored thing… In our UMH senior living communities, Valentine’s Day can never come and go without the sharing of stories – love stories, of course. And who doesn’t love a good love story, right? In this article, residents from our communities share their lifelong love stories and a bit of advice, as well. We hope they will inspire you – and warm your heart this Valentine’s day! Just to be clear, there is no single definition for “assisted living” when it comes to the services and care a community will provide. 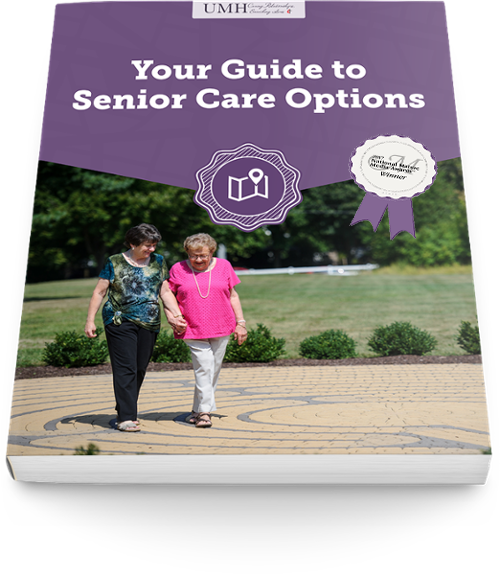 Navigating the senior living process can be a huge challenge for families. With so many options and so many different communities to consider (all at different price points), how can you be sure your family is making the best choice? As you look at different senior housing options in Connecticut, keep in mind that the right option for one senior might not be the right option for another. Do you have some questions about assisted living before you consider helping your parent make the move? Explore the answers to some frequently asked questions about assisted living in Connecticut. It’s that time of year. Snow, holidays, baking, and presents. While many people love the winter months, the cold, snowy, icy weather can pose a number of challenges for seniors, especially if they still live in their own homes. Planned giving is an excellent way to remember those organizations and charities that have meaning or are special to you and your family. Gifts can be made while you are living or after you are deceased, and can be made from wills, trusts, annuities, retirement plans, or life insurance. Gifts can have a tremendous impact on the future of an organization or charity, enabling renovations and updates, expansion, and additional staff and services, just to name a few benefits. Are you searching for memory care in Connecticut for a senior parent or loved one? Memory care is a highly specialized type of care that, while being perfect for some, isn’t for everyone. There’s a difference between a senior having forgetful moments and needing to be in a memory care facility. To learn a little bit more about what memory care is and what your options for memory care in CT are, let’s look at some of the questions we’re frequently asked. What is assisted living? If you’re asking yourself this, you’re not alone. While it may seem like a basic question, it’s one that staff members at senior living communities are frequently asked. Between assisted living, nursing homes, retirement communities, and more, there are a lot of terms that are easy to confuse when you’re considering housing for a senior loved one. To find out if assisted living is right for your family member, you need to understand what this type of senior living entails and the level of care it can offer. Assisted Living vs. A Nursing Home: Where Do I Belong? Most people use the terms “assisted living” and “nursing home” interchangeably. However, they offer two very different types of care. And depending on the needs of you or a senior parent, one option could be the right choice while the other could fail to meet specific needs. Before deciding between assisted living or a nursing home, you need to really understand how these two options differ. Let's look at what assisted living communities and nursing homes have to offer, and find out how to determine which one is best for you or your loved one. Did you know that 14% of Connecticut's population is made up of senior citizens? And, the number of citizens over 65 is expected to increase by 38% over the next 15 years! As more and more Connecticut citizens join the senior population, there’s never been a better time to focus on senior wellness. With a high senior population, there are plenty of opportunities for seniors to stay active. Whether your parent or a senior loved one lives at home or in an assisted living community, it’s really important for them to keep moving. In today’s age, many seniors are living at home alone. Some may be thriving – they live independently, can cook, clean, drive, socialize and are as sharp as a tack. This is the ultimate goal: to stay in the family home for the rest of their life. However, the reality is that most seniors don’t thrive at home in their later years and although family members chip in and offer their assistance, the quality and consistency may lack. Medication management is something that should not be taken lightly, as it ensures the good health of your loved one. Sadly, without proper education and training, medications are often mismanaged, or dosages are skipped altogether. At assisted living communities, your loved one is guaranteed the care they need to thrive in their golden years. This article will break down the importance of senior medication management and options you have when it comes to care. As a parent or loved one ages, a bad fall or a crisis may seem inevitable. In fact, every 11 seconds, a senior is admitted to the emergency room due to a fall-related injury, and every 19 minutes a senior dies due to a fall-related injury. And, according to the World Health Organization, “in the United States of America, 20–30% of older people who fall suffer moderate to severe injuries such as bruises, hip fractures, or head trauma.” These are major risks you don’t want your parents to take with their health. The 27th annual National Mature Media Awards recently honored the nation’s best marketing, communications, educational materials, and programs produced for older adults. After a parent or loved one has a bad fall or faced a serious illness, they may be required to go through short-term rehabilitation. As part of the recovery process, it is common to consider a move to a more supportive living environment after they leave the rehab facility. This is the best option to keep their physical recovery on track. Transitioning to assisted living is a wise choice, both from a safety and a care perspective. As your parent’s time in a short-term rehab is coming to a close, you can start taking steps now to ensure transitioning to assisted living is an easy process. A fall is traumatic, both for the senior who experiences the fall and the family who is scared and now faced with decisions about their loved one’s future care. If your parent is recovering in the hospital or a rehab facility, you’re probably eager to get them home and back on the road to the recovery. But, after a fall, transitioning to assisted living could be the best move for your loved one. You’re overwhelmed and Mom or Dad needs more care than you can provide them as their cognitive health declines. You’re worried for their safety and you’re beginning to think it’s time to get outside help. Does this sound like you? It’s most likely time to start looking into senior care options, especially if your loved one has been diagnosed with Alzheimer’s disease or dementia. Nonprofit vs. For-Profit Assisted Living: What’s the Difference? After looking at handful of potential homes for an aging loved one, all your options probably start to seem the same. However, each community is unique, with specific features that sets them apart. One difference you should pay attention to is whether a community is nonprofit or for-profit. This could have a huge impact on the experience your loved one has. Before you choose a community for our loved one, you need to learn more about how nonprofit and for-profit communities differ. Once you know more about these distinctions, you able to make the right decision for your loved one and your family. Salty air, gently rocking boat, warm sunshine and the thrill of catching fish - sounds like life on the ocean! David Kruh, 3 year resident of Middlewoods of Farmington, spent most of his life on the Connecticut shoreline, having grown up in Old Saybrook. From an early age, he developed a love for fishing and the open water. Although David sometimes goes to Old Saybrook to fish with his brother, he admitted to staff members at Middlewoods of Farmington that he hadn’t been on a charter boat in a very long time. After hearing this, the Middlewoods Dream Team, led by Activities Director, Tanya Janeczko and Maintenance Director, Mike LaMere, worked to make David’s dream come true. Are you dreading having the “assisted living” talk with your parent? Maybe you’ve already talked to them about moving into an assisted living community, and they were resistant to the idea. Leaving your home and moving into a whole new community can be uncomfortable and overwhelming for seniors, but in most cases, it’s the best way to promote their wellbeing. Let’s face it. Your parent or loved one has been collecting things for a long time. And helping them to get rid of some of it may be a challenge — especially when the clock is ticking on their move to an assisted living community! If life is truly about entertaining every possibility, Carmella Barone, 94, and Eileen Pastore, 91, are ready for excitement on any given day. These two ladies, both residents of Bishop Wicke Health and Rehabilitation Center in Shelton, Connecticut, share a vibrant spirit, a young-at-heart attitude, and a love of gaming. Since moving to the award-winning healthcare community, neither of them have stopped talking about their dream to experience the night life at Mohegan Sun. Sure, they’ve taken day trips to the casino and enjoyed themselves, but these ladies are hoping for just a bit more. They both know that to really experience the excitement of Mohegan Sun, they need to stay awake a little later. After all, life is a late night out and an even later morning in, right? You hear about Medicare and Medicaid a lot, on the news or from your family members or friends. But, if you’ve never had to draw from either program, you might not know how they differ. When people are looking for ways to pay for their senior loved one’s healthcare or assisted living expenses, Medicare and Medicaid could be beneficial sources of funding, depending on your needs. Explore this article to learn a little bit more about the differences between Medicare and Medicaid, who qualifies for program eligibility, and whether or not these programs could help cover your loved one’s healthcare expenses. Happy Fourth of July! As we enjoy Independence Day, it’s important to remember that this day is SO much more than just a day off from work. Since 1776, July 4th has been celebrated as the birth of American independence. This national holiday is a symbol of patriotism and pride for all Americans, and while you enjoy your backyard barbecue, beach day, or fireworks, it’s important to remember who helped get us to where we are today – our veterans. Memory Support vs. Assisted Living: Which Option is Right for Your Loved One? Trying to choose and afford a senior living community for your loved one can make your head spin. There are so many options and levels of care; how are you ever going to choose the right one? Is It Time for Specialized Assisted Living and Memory Support? Are you at a point where you’re no longer sure it’s best for your senior loved one to live at home? For many people, it’s a hard decision to relocate a parent or other loved one into a senior living community in Connecticut. But, when this is the best place for their needs to be met, the decision is much easier. As an estate planning attorney, I have worked with many clients who do not know what a Power of Attorney is, and why they should execute one as part of their estate planning documents. In this post, I am happy to explain the ins and outs of this important document, and why it’s necessary to any estate plan, for those of all ages. I’ll also explain the difference between a financial Power of Attorney and a medical Power of Attorney. What Are the Best Senior Care Options for a Loved One with Alzheimer's or Dementia? When a family member is diagnosed with Alzheimer’s disease or dementia, their life isn’t the only one that changes; your family members’ lives change, too. Caring for a loved one with these diagnoses is a huge challenge. As their symptoms progress, they become more and more dependent on care, which might be hard to manage if you work full time or live far away. For Christmas, most families give their loved ones clothes, games, or sweets, but this Christmas, Don Walkley, a 92 year old resident of Crosby Commons Assisted Living Community, received a 5,923 piece LEGO set of the Taj Mahal. Lining the shelves of his apartment are famous buildings Don’s built from intricate LEGO sets, including the White House, Eifel Tower and the Lincoln Memorial, but none have compared in size to his new Taj Mahal display. Don’s family chipped in for Christmas and surprised him with the $300 puzzle and since December, Don has worked hours every day to complete the massive puzzle. If you’re caring for someone with Alzheimer’s Disease, you know how challenging and delicate this stage of life can be. Although every person with Alzheimer’s has different needs, there are some steps you can take to make caring for them easier, from providing structure in their lives to changing your communication styles. Are you and your family members searching for the best senior housing option for a loved one? Preparing to make this monumental decision isn’t easy. You want to ensure your loved one is happy and healthy, but you also have other important factors to consider like price and care needs. Planning for retirement and care for one’s later life can be hard to do. With so many possible costs and unexpected events, budgeting and saving money aren’t easy tasks. You never know how much money will be needed to afford senior living costs. The slogan “home is always better” is often used by senior home care companies to tout their services and dismiss the benefits of senior living communities. But the truth is, home is not always better for older adults -- despite what savvy marketers want you to think. Let’s take a closer look at four reasons why the family home may not be the better fit for your aging loved one. Are you or a loved one ready to make the move to assisted living but hesitating because the thought of downsizing is daunting? We understand! No one wants to get rid of their “stuff,” but when a move to assisted living is necessary, decluttering and downsizing is a must. In this resource, we break down helpful ways to downsize so you can successfully transition to your new home in a senior living community. Marian Taylor, resident of Wesley Village, was born on March 26, 1922. Her father was a Methodist pastor and she moved about quite a bit as a child, living in various parsonages in parishes where her father was assigned. Marian had a happy childhood, though she was constantly changing schools and making new friends. This is the life she knew and it fit seamlessly with the role she would later assume as the wife of a Methodist pastor. Is it time for you or a senior loved one in your family to move into an assisted living community? There are a number of reasons it could be time to move, like healthcare needs or just the simple desire to enjoy retirement. While you may be ready to make the transition, you also want to be sure you can afford the type of senior living community you’re comfortable with. Are you concerned about how you’re going to afford senior living for your loved one? If so, you’re not alone. Many families struggle with how to cover the costs of caring for their loved ones. Explore these five ways you can cover senior care costs for your loved one, while still ensuring they get the highest quality of care and have the most fulfilling life possible. So you or a loved one has decided to move to a senior living community. Your head may be spinning. You may not know what to do when you get there, how to settle in or what procedures to follow. The process may seem overwhelming, but luckily, it won’t be, especially at Wesley Heights! Donna Brice, Resident Service Coordinator of Wesley Heights Apartments and Cottages, will be there for you. Are you looking for an assisted living community for your loved one to move into? In your search, you might be overwhelmed by the number of choices. How can you be sure you and your loved one are selecting the best community for their future? Is love at first sight really possible? Myrtle Caswell, 6 month resident of Middlewoods of Newington, would say “absolutely” and credits her 68 year marriage to true love. When Myrtle was 20 years old, she was seeing a young man named Bob. One night, Bob asked his friend, Everett, to drive him to see Myrtle. When Bob and Everett arrived at Myrtle’s house she wasn’t home, so they asked her mother where she was. Myrtle was next door babysitting, so they called her up and told her they wanted to come see her. Myrtle said no, and that no one was allowed to come over while she was babysitting. Bob and Everett waited at her house. Winter months can be a dreary and boring season for anyone, especially seniors. Shorter days and poor weather conditions make it hard for seniors in assisted living communities to get out and stay active. Fortunately, there are plenty of winter activities for seniors in assisted living communities to keep them busy, healthy, and in high spirits. Let’s look at a few of the ways seniors can still enjoy an active lifestyle, even when winter weather won’t cooperate! Navigating the world of senior living and care options can be pretty tricky. Wouldn’t it be nice to have a road map? Or maybe just something (or someone) to help guide you along the best path? Whether you are planning ahead to avoid a crisis or you are scrambling to take care of an immediate need, you probably need help finding the most practical solution for your aging loved one’s changing care needs. Adult children are tasked with many important decisions when it comes to the care and well being of their parents. While easing the transition through the aging process may seem overwhelming, the results can be fulfilling -- both for caregivers and seniors. Read on to learn more about how to promote a fulfilling quality of life for your aging loved ones by enabling their sense of independence. Today, we highlight a woman whose perseverance and strength have gotten her so far in life. With a musical background and a love for theater, it’s no surprise Norma Remele, 3 year resident of Wesley Heights, has a particular fondness of Phantom of the Opera. When Activities Director, Linda Fera, heard about Norma’s interest in this esteemed musical, she jumped into action to see what she could do with the UMH Journey of Dreams program. One of the most asked questions regarding senior care involves "the conversation"...or how to talk with your parents about assisted living. Many caregivers dread having this discussion and with good reason. How will mom or dad respond? Are they going to think you are trying to take away their independence? How can you communicate your concerns to them without making them defensive or angry? We often talk about the importance of exercising the body, but exercising the brain is equally as critical. And there’s no better time to start giving your brain a daily workout than now. Formerly associated with children, brain teasers are now known to have brain-boosting benefits for adults of all ages, too. Let’s take a closer look at why brain fitness matters and how to get your daily workout started. Health is undoubtedly every individual’s number one priority. It is essential to pay attention to your health restrictions, eat healthy and exercise. Assisted living communities offer programs to meet dietary restrictions and preferences as well as varied exercise programs and classes that cater to all residents’ wants and needs. As individuals grow older, proper health care and a healthy lifestyle becomes even more important. It's the perfect time to focus on informing yourself of the importance of healthy food choices and lifestyle changes. Forty years ago, The Academy of Nutrition and Dietetics named March as National Nutrition Month to "focus attention on the importance of making informed food choices and developing sound eating and physical activity habits." These days over 50% of seniors are surfing the net, and just over one-third of seniors 65 years and older are actively participating in social media networks. A study, carried out by the Pew Institute shows that the “GI generation”—those 76 years and older—are not so much ‘in the game’ at 34% internet use but this doesn’t take away from the fact that seniors are attempting to stay on the cutting edge of technology and it’s reflected in the numbers, which have been steadily trending upwards over the last few years. Researchers are finding that seniors who readily adapt to technology benefit from improved quality of life on both the social and health fronts. My name is Marie Pfannkuch. I am 100 years old and I’ve lived at Wesley Village for 10 years. My husband was German, which is where I get my last name from. My mother was Italian and my father was English and Irish. Before we hear the rest of Marie's story, I (Chelsea) just wanted to say a few words about her. I met Marie when I learned she had received a letter from President Trump after turning 100 years old. She was very excited and wanted to show someone her letter. When I met Marie, I instantly liked her. She was funny, kind, beautiful on the inside and out, and I could tell she had an amazing story to tell. We worked around each other's schedules until finally we could meet up and I could learn more about her life. And I have to say, I thoroughly enjoyed talking with Marie. Her life has been filled with boundless love, family and friends. What more could a girl ask for? Read on to hear Marie's story. With 10,000 people in this country turning 65 years old every day, and the share of older adults predicted to rise from 14.5 percent in 2014 to 21.7 percent in 2020, one of the largest challenges facing society is senior housing. Where will these older adults live, and are current housing options up to the task? The issue is compounded by the fact that the majority of older adults are pushing back on the idea of conventional nursing homes and leaning more towards assisted living apartments. Is Independent Senior Living Right for Your Loved One? For seniors, independent living represents both a structural setting and a physical ability. You may have heard the "structural setting" described by other names such as retirement homes or senior apartments, but they’re one and the same; and residents of independent living communities are healthy enough to live on their own and take care of themselves. Out of all the different senior housing choices out there, what makes this type of senior living the most suitable for certain seniors? Although he was born in Haugesund, Norway, Arthur K. Hansen, better known as “Chuckken”, grew up in Glendale, Long Island. He attended Newtown High School in New York and was an active cross country runner. Additionally, he played softball and was a very good student. Read on to learn more about Arthur and his time living at the UMH community, Middlewoods of Newington. It’s a five-letter word no one ever wants to hear. “I’m….BORED!” And it’s not just small children who suffer from boredom; it can happen to all of us -- including seniors. Older adults get bored, too. Counter boredom by engaging in activities with your loved one. Often senior citizens and their loved ones wrestle with the decision of whether or not to move out of the family home into an assisted living community. While at first glance this move might seem counterintuitive, assisted living communities offer seniors the chance to maintain and even regain some of their independence, while at the same time relieving themselves of the major stresses of trying to take care of their own home. Born in New York City in 1920, James, better known as Jim, has had a life full of love, excitement and travel. Jim’s upbringing was very unique because both of his parents were deaf, which taught him many lessons and offered him a different perspective on life. Jim lived in the Bronx in a suburb called Riverdale where he was valedictorian of his elementary school. From there, he attended DeWitt Clinton High School, and then Stevens Institute of Technology. Twenty five years later, he received his master’s degree at the University of Bridgeport. Jim became an Eagle Scout, which is the highest achievement attainable in the Boy Scouts of America Program, and was a member of the Air Force, serving from 1943 to 1946. Caregivers are never short on giving of themselves. Sandwiched between trying to balance family life with children who haven’t yet left the nest and taking care of parents wholly dependent on them, caregivers have quite a lot to manage. As a native to Long Island, New York, Billy Coulter grew up loving weekend trips to his family’s house in Sag Harbor. From Friday through Sunday, he would head there and spend time with his mom and dad. Billy recalls, “My father purchased a boat for us and we used to go sailing often. I remember the warm summer days and the cool summer nights. My mother used to iron my sheets when it was a chilly night in order to warm them up for me.” Billy also reflects fondly on his weekly dance lessons he took with his mother in New York City. Does an Assisted Living Apartment Make Sense for Your Loved One? Family members searching for the best living situation for their aging loved one have quite a job ahead of them. Not only will they spend time researching, comparing, and touring various senior living communities, they will also have to decide what option makes the most sense for their loved one's unique situation. It can be a lot to process all at once, and many caregivers find the information overwhelming. In these cases, it might help to zero in on one option at a time, and learn as much as you can. Among the living options you have to consider are assisted living apartments. Some caregivers are initially confused by the term "apartment," as it seems to imply a certain amount of responsibility on the part of their relative that may be beyond their capabilities. To help clear things up, we are presenting a list of benefits of our Connecticut assisted living apartments, such as our community Wesley Heights, and what both you and your loved one can expect from their new home. For an older adult, the choice between assisted living and independent living usually depends on how well an individual can manage daily activities without extra assistance. Examples of daily activities include, but are not limited to: preparing meals, personal hygiene, managing medications, completing household chores, driving/coordinating transportation, and maintaining personal finances. Someone who has difficulty with any of these daily "independent" activities may want to consider the maintenance-free lifestyle of an assisted living community. When an aging loved one is in need of extra care and support, many families jump to the task themselves. With the absolute best intentions at heart, family members rearrange their work schedules, create space in their homes, and rethink their household budgets so they can give back the kindness and compassion that their relative has shown them. Undoubtedly, this is not only admirable, but it can also be a very important opportunity for further bonding and understanding between the two of you. Often, our aging loved ones are not ready to leave their homes and families, and caregivers do not feel prepared financially or emotionally to press the issue. Making the Assisted Living Decision: Don't Put it Off Any Longer! When it first becomes apparent that an elderly loved one is no longer able to live on their own, many families try to remain committed to providing the extra assistance and care themselves. Sometimes, this involves moving your loved one into your home, or spending a portion of each day with your aging relative. However, there often comes a time when caregivers realize that they are getting in over their heads. Sometimes this can happen as the result of your loved one’s declining health, added family or career stress on you, or perhaps an incident which has made you realize that your loved one’s current living condition is no longer safe for them. Running out of money is a real possibility for some who have made senior living communities their home. The money runs out for a number of reasons and common among them are: longevity (the average length of stay in assisted living is 2.5 years but many live there significantly longer) increasing rental costs, increasing costs in senior health care services and a need for more assistance with activities of daily living (ADL) than before. There are others, but these situations just mentioned place an immediate draw on private funds. It might be nearing the “right” time to move a parent into an assisted living community when health and safety needs are putting your loved one at risk in their home. If this is your concern then it’s time to have a talk with your loved one. Often there are telltale signs of something “not right” in the home that you can address quickly before things spiral out of control. Change is inevitable. As your parents age, you often become their strongest support system. But for many adult children, this may be the one challenge you’re not quite ready for! When caring for aging parents, it usually becomes necessary to have a talk with your loved ones regarding matters of change, such as senior living and long-term care options, legal documentation, and financial decisions. Before any adult child can have this talk, it is important to come to terms with the health changes of your loved and evaluate how these changes will affect the rest of the family. The Aid & Attendance Benefit: Is Your Aging Loved One Eligible? Have you noticed lately that your aging loved one may be in need of a little extra care? If so, you're probably in the process of deciding which option is best. Should you get in-home care or should you consider assisted living? This decision often is a confusing and overwhelming process, especially when money is a factor. It's difficult to see what you have budgeted and what you can afford. An unfortunate reality of caring for aging loved ones is that we are often the ones called upon to deliver bad news and support them as they cope with it. Those that must do so often feel inadequate to the task. There is no easy way to share such information, but there are some guiding principles. When you are the one to talk to an aging loved one about something you know will upset them, even as it upsets you, where do you begin the conversation? Deciding between home care and assisted living can be a confusing, stressful, and time-consuming process. As a caregiver, you naturally want what is best for your aging relative, but you also know that there are limits to what you can do – both physically, and financially. Many caregivers considering assisted living report that their loved ones are reluctant to leave their home, or to be away from family members. All of these factors are what make this decision so very personal. Like many topics related to death and dying, families tend to avoid the topic of hospice care until a physician or social worker brings up the subject. This is unfortunate because studies show that people tend to live longer when they receive hospice care in CT. When you and your family know about the services and benefits of hospice, you will feel more comfortable discussing it with your doctor when the time arises. Cost is among the biggest concerns for families providing eldercare for a loved one. Indeed, cost can sometimes be a roadblock standing in the way of you providing the best possible situation for a relative in need. While there may be some families out there that are able to cover assisted-living costs without too much of a financial impact, for others, figuring out what to do next will require some serious number crunching. One of the questions we hear most frequently is "How can I find the best senior living community for my budget?" To help answer this, we have come up with a step-by-step guide to get you started. Follow the recommendations on this page, and you'll begin to have a clearer picture of what assisted-living will actually cost you. Caregivers often report feeling frustrated as they try to determine the true cost of assisted living for their loved one. There may be a price list detailing the different costs of, say a studio, a one bedroom, or two bedroom apartment, but that doesn't always tell the whole story. What about meals? What about cleaning services? Will these added expenses combine to price you out of something you thought was affordable? Life Still Revolves around the Kitchen Table At UMH communities, we understand how important meals and mealtime are for our residents; often they are the highlight of each day. Meals are a time to meet up and socialize with friends, a time to talk with dining staff, and get caught up on what’s new and exciting, and a time to choose from a variety of menu items that are both nutritional and nurturing. For those on a restricted diet, we offer choices so they don’t get into a food rut. No one wants to eat the same old food each day at every meal. It can be difficult for individuals and families to get straightforward cost figures when trying to plan for assisted living. There are a few reasons for this. For starters, if you are planning in advance, you won't necessarily know the level of care that will be needed in the future. You also may not be clear on whether a loved one qualifies for certain assistance, and of course, you'll have a variety of assisted living facilities and senior living communities to choose from. Still, according to recent surveys, it's safe to say that you're looking at costs between $2,000 and $5,000 per month. Regardless of when or where your loved one will be transitioning to a new community, one of the chief concerns among caregivers is paying for assisted living. That's not the kind of money most people have on hand, and it can create some real financial hardship. Arranging quality care and a healthy environment for your relative can be stressful enough on it's own. Throwing cost into the mix can really make you feel overwhelmed. Is My Parent Ready for Assisted Living? How can you tell when your loved one is ready for an assisted living community? If only it were as simple as a big, red flag popping up saying “NOW IS THE TIME!” Well, you may not see the big flag but chances are there are lots of little indicators that may have gone unnoticed. If your parent or loved one is having more and more difficulty with everyday activities, such as getting around the house, running errands, showering and dressing, NOW is the time. Helping mom or dad recognize their changing needs and cope with an impending move is important. If your loved one is opposed to or reluctant to make a move, suggest a short-term, trial stay at an assisted living community. They can take a “test drive” but not commit to a permanent move. Meet the Family: John Buccini! Shirlee Sheathelm moved into Middlewoods of Newington just a few short months ago. I first met her and her family when they came in to take a look around. Shirlee had a warmness and honesty about her and was genuine with a good sense of humor. We had an instant connection, and I knew she would blossom at our award-winning senior living community as she was ready to embrace making a change to enhance her life. No matter your age or life stage, making new friends can be challenging. As we age, the opportunities to meet and connect with new people dwindle, leaving us hanging onto a handful of true friends we've made throughout the years. After retiring, our loved ones experience these issues just like we do, except they have added challenges. My Doctor Recommended Short Term Rehabilitation, But Do I Really Need It? When a loved one has medical needs that require a more concentrated level of care, their doctor might recommend short term rehabilitation. But what does that mean, and is it really necessary? For the most part, aging relatives can receive the care they need by keeping up with their regular doctor visits, and dutifully taking all prescribed medications. However, when something more serious comes along, it becomes very important for your loved one to have access to a greater amount of professional care. This is where rehab comes in. While many seniors and caregivers embrace the idea of “aging in place” at home, assisted living communities offer a number of benefits that aren’t always available to aging adults who remain in their homes. Wondering if assisted living might be the right fit for your aging loved one? Meet the Family: Amy Broadbent! There are three circumstances under which people seek out information on assisted living. The first is when it is becoming apparent that the needs of a loved one will soon exceed the capacity of the caregiver. The second, is after a crisis which proves that the caregiver is in over their heads and needs immediate assistance. The third, is when an individual plans well in advance for their own care through their mid and late retirement years. Unfortunately for many caregivers, the third option does not happen as often as we might like. Valentine's Day is a holiday for couples. This holiday can be very painful when a loved one doesn’t have their husband or wife by their side. For your widowed mom or dad, they could be experiencing this pain. Watching others celebrate with their spouses can trigger deep sadness, and even depression, in your aging loved one. Superbowl Sunday is the second largest food consumption day in the US, following behind Thanksgiving. You've probably seen (or even prepared) some of the massive spreads associated with game day, and therefore already know that Super Bowl snacks aren't exactly heart healthy. A Super Bowl party without food would be a sad affair indeed, but what happens when you have some health considerations to plan around? Those caring for relatives suffering or recovering from heart-related conditions suddenly find themselves facing the prospect of taking the junk food out of a day that traditionally celebrates the unhealthiest menu options. Fear not! With our Super Bowl recipes for seniors, you can prepare some truly delicious and healthy treats that everyone in your family can enjoy. Here are our favorites. Staying active is a core component of supporting overall health and quality of life as we age. Unfortunately, this can be easier said than done as seniors face many challenges to mobility, including everything from age-related chronic health problems to fears of falling. However, it is possible for older adults at any age to start enjoying the many body and brain-boosting benefits of fitness and exercise. Wondering where to begin when it comes to getting your aging loved one up and moving? Start with the five limited mobility fitness tips for seniors. Meet the Family: Ginny Brown! When we think of the phrase “professional photo shoot”, we think of beautiful models, groomed to perfection and picture perfect. It seems high quality photography paired with flawless models is the key to a great picture. But is it really? Limited daylight. Icy roads. Frigid temperatures. These are just a few of the challenges associated with winter driving. For many seniors, unfortunately, these issues can be heightened by age-related factors. With a little planning, preparation and the following five driving safety tips for seniors, caregivers can do their part to help keep aging loved ones safe on the road. Winter’s arrival doesn’t have to equate to a boredom sentence for seniors living alone at home. Whether you’re stuck in a rut with your aging loved one or simply looking for a new activity to add to the lineup, there are near-endless ways to get older adults up and out of the house when the thermometer drops. Read on for a roundup of nine fun and affordable places for seniors this season. What happens when home is no longer the safest place for your aging loved one? What happens when mom or dad refuses to consider alternative living options even though you know living on their own isn’t working out? For most people, the winter holidays are happy days. For some seniors, however, this festive time of year brings out their inner Scrooges. For not only your aging loved one but for caretakers and family members as well, this can be a very challenging time. The good news is that you don’t have to hunker down and wait for the holiday blues to pass. Read on for six steps caregivers can take to cope with a senior’s bad behavior while reacquainting themselves with the spirit of the season. Think Christmas revelry is just for the wee ones? Think again. The weeks between Thanksgiving and New Year’s are packed with opportunities for caregivers to help older adults catch the spirit of the season. Even better? They’re fun for caregivers, too! Let’s count down seven terrific winter activities for seniors this Christmas. Millions of Americans eagerly await the Thanksgiving feast every year. For people living with diabetes, however, the inability to indulge in their festive favorites can lead to disappointment. But managing diabetes doesn’t have to mean missing out on an amazing meal -- particularly when caregivers incorporate plenty of healthy options into the menu. Read on for a roundup of seven diabetic friendly recipes perfect for pleasing all of your guests this Thanksgiving. Six out of 10 caregivers report having experienced one or more impacts to their employment situation due to their caregiving responsibilities according to the AARP’s “Caregiving in the USA” report for 2015. These consequences can include everything from having to cut their hours to being reprimanded for poor performance or inadequate attendance. A staggering 87 percent of adults over the age of 65 say they want to remain in their current homes and communities as they age, according to research from AARP. Unfortunately, wants don’t always match needs -- especially in the case of seniors for whom living alone may no longer be a safe or realistic option. Many caregivers share a common dilemma when it comes to helping aging loved ones accept a move from a cherished home into senior living. Read on for three tips aimed at fostering a positive transition and best outcomes for all. Crosby Commons at Wesley Village is an extra-ordinary Assisted and Independent Living community; not just in the services and amenities it offers but also because of the operational philosophy we practice. Being part of United Methodist Homes (UMH), a mission-based organization, the decisions we make as a community are focused on doing the right thing for our residents and staff. 7 Reasons Middlewoods of Farmington is the Right Senior Living Community for You! Tucked away behind the UCONN Health Center is one of the most award-winning independent and assisted living communities in Connecticut; a place where residents live life to the fullest, where residents’ families and friends are welcomed, and where residents and families become members of the Middlewoods of Farmington family. This unique community is also a place where staff come to work knowing they are encouraged to build relationships with residents in order to provide better care and find joy in their work. With all the assisted living options available to you in Hartford County, why would so many people stop looking after they’ve visited Middlewoods of Newington? Perhaps it was the one-floor living that was most appealing. Maybe it was the strong sense of family they felt when they walked through the door. It might have even been the warm, welcoming interactions they had with the Middlewoods staff and residents that left them feeling at ease. Believe it or not, it is pretty common for the prospective resident and their family to realize they want to become a part of this special community even after one phone call. How can that be? Senior Friendship - Does Your Aging Loved One Need a BFF? Terms like “BFF” and “bestie” may be new to our vocabularies, but the basic concept remains the same: Everyone needs a good friend. Having a strong social network may be even more critical for seniors, according to research indicating the paramount role of friendships in supporting quality of life during the golden years. Let’s take a closer look at why friends are so important, along with highlighting tips aimed at helping aging loved ones live better with a little help from their friends. An abundance of research highlights the value of relationships between pets and humans. The generation most likely to benefit from animal companionship, according to findings published in the European Journal of Medical Research? Older adults. Let’s take a closer look at why seniors and pets are a perfect fit, along with tips for helping your aging loved one choose the right pet. Did you know that Medicare is one of the country’s largest group health insurance plans? And while millions of Americans are eligible for this federal program, few people understand its ins and outs. Let’s take a closer look at this tricky topic, along with some things to keep in mind when evaluating your Medicare options. People in different stages of life have different legal concerns. Older adults, in particular, face a number of legal considerations which differ from the ones they may have faced earlier in their lives. Attorneys who focus their practices on the area of elder law, also referred to as “elder care,” offer specialized expertise and guidance for older individuals and their families. Let’s count down five ways hiring an elder law attorney makes smart sense, along with a few things to keep in mind when finding and hiring an elder law attorney. We often talk about the need for caregivers to take a break from the demands of caregiving. One simple way to do so? Watch a movie. And while heading to your local cineplex is one way to escape, you can also relax and recharge while watching a movie at home in the company of your loved ones. Read on for a list of five movies which are likely to delight caregivers, their kids, and aging loved ones alike. The number of Americans without any close friends has dramatically escalated over the past two decades, according to a report from the AARP. Unfortunately, older adults are not only particularly vulnerable to this phenomenon, but are also more likely to struggle physically and emotionally due to isolation. Let’s take a closer look at why socialization (the “s” word) is so important for seniors. And find some caregiver tips for helping aging loved ones enjoy all of the benefits of spending time with others. Senior Living Communities: A Threat to Independence? If you’ve ever broached the subject of moving to a senior living community with an aging loved one, you may have been met with the some variation of the response, “No way. I want my freedom.” You’re hardly alone if you’ve encountered this form of resistance. In fact, the vast majority of seniors claim to want to “age in place.” Guiding this preference? The belief that senior living communities are a threat to independence. Let’s take a closer look at the issue, along with why it may be time to embrace a new perspective when it comes to senior living, freedom, true independence, and something even more vital: quality of life. That Crazy Farm Life – Meet Rita Klingenmeier! Meet Rita Klingenmeier, a resident at one of our award-winning UMH communities: Middlewoods of Newington. Rita made the move to Middlewoods in the fall of 2015 and since that time, has enjoyed a healthy and active lifestyle in the community. We all need time to relax and recharge. For many, reading precisely fits the bill. For caregivers of loved one’s with Alzheimer’s disease and other forms of dementia, reading can also provide something else: much-needed empathy and understanding. Check out these five works of fiction, each of which may offer some unique insights into living with Alzheimer's disease. While seniors are fast growing users of digital technology, there are some obstacles to adoption among the 65 and over set. Social media, in particular, can be imposing territory, and yet it also offers plentiful payoffs for those who persevere. If you’ve thought about introducing your aging loved one to social media but have never done so, now might be the perfect time to make that connection. Let’s take a closer look at older adults and social media, along with tips for helping seniors get social. Summer is here - school is out for children, everyone is enjoying the beach, the picnics, and the warmer weather... but for many caregivers, it can be hard to take a break. When an aging loved one needs frequent visits, daily phone calls, and help managing medical appointments, meals, household responsibilities and more, a vacation can seem like a distant dream! One of the leading concerns many seniors have about moving to an assisted living community is losing their independence. After all, many of us first encounter “freedom” around the age of 18 and never plan on looking back. But the truth is that not only can assisted living help promote a sense of freedom in terms of keeping older adults engaged in everyday activities, but it can also lead to a better quality of life during an otherwise precarious time. Let’s count down three ways assisted living can encourage independence. Dealing with tragedy can be especially difficult for your aging loved one. For many older adults, loss becomes frighteningly more common throughout the aging process. Whether it be the loss of a spouse, a child or sibling, a good friend, or even a pet, these circumstances can weigh heavily on your loved one for several months. Whether seniors have a lifelong love of gardening or have never grown anything green - ever, research increasingly points to the many reasons why tending to a garden is good for older adults. From encouraging physical activity to promoting food security, the benefits of gardening go on and on. Gardening has even been been proven to be therapeutic for people with Alzheimer’s disease! The observation of National Garden Week -- celebrated in 2016 from June 5-11 -- is the perfect opportunity to encourage seniors to start enjoying the benefits of gardening. Not sure where to begin? Consider these three simple gardening projects aimed at helping aging loved ones get up close and personal with nature. Life in the Political Circle - Meet Bill Raymond! “So, okay now, raise your hand if you were born into a "show biz" family. (I'm looking for hands.) Yes, I see your hand, Bill. Anyone else? I guess not. So the next question is, has anyone here in this room met any United States presidents? Again, I only see Bill's hand. What president, Bill? Am I hearing you correctly, Bill; Presidents Truman, Eisenhower AND Kennedy?” Perhaps we should be telling this story from the beginning. Why Consider a 60-Day Trial Stay? It is important that you feel at home in your new senior living home. But how do you know if you're actually going to be comfortable and happy in this new space? Whether it be our Middlewoods Assisted and Independent Living Community in Farmington or Newington, we have your comfort in mind. We invite you to try out maintenance-free living with our unique 60-day trial stay....with no long term commitment!